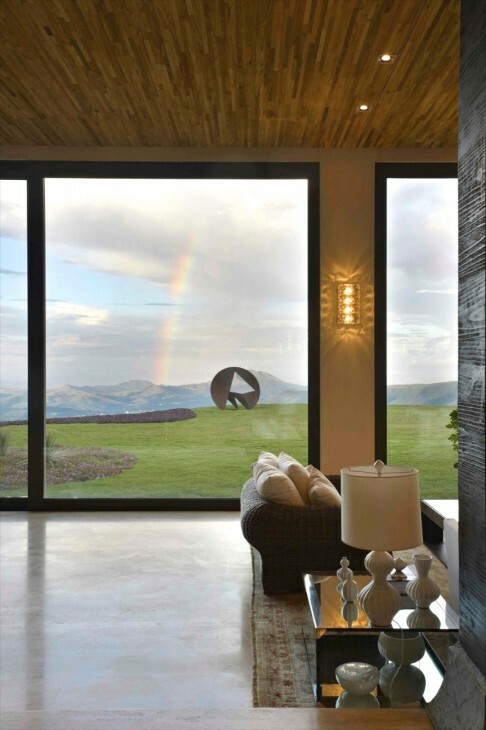 On to the interior of this home designed by Eduarda Correa, who established his architecture and design firm in 1994 in Belo Horizonte, Brazil. First, a couple of notes for inquiring minds from yesterday’s post. The ceiling in the pool area is natural straw. The straw blocks surrounds a fully retractable roof! The lights in the pool area came from ABC Carpet in NYC. 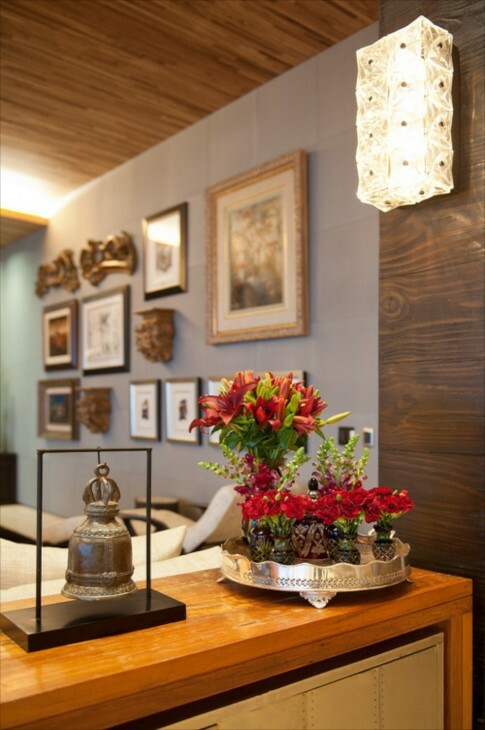 Throughout the house you will see a mix of high end furniture and antiques, complimented with art and lighting that adds to the Asian vibe in the decor. In case you missed part I you can read it here. 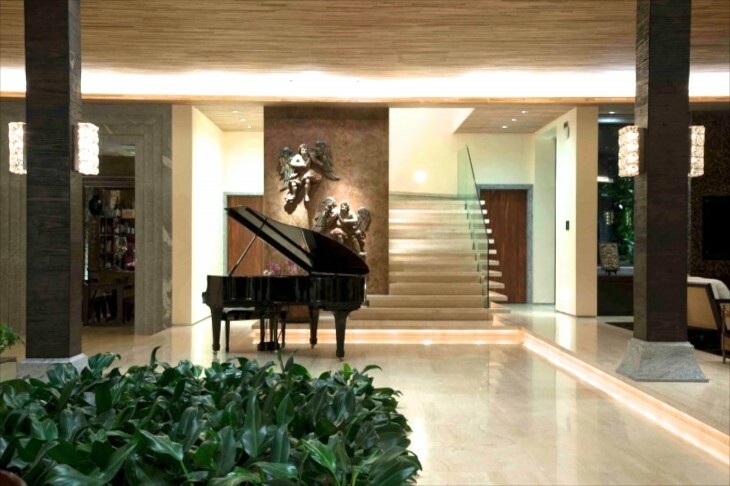 What a gorgeous foyer with the black grand piano. All the stone floors are travertine marble, which is a favorite of mine, because it looks “soft” if that can be said of a stone. It has beautiful but subtle pattern throughout. 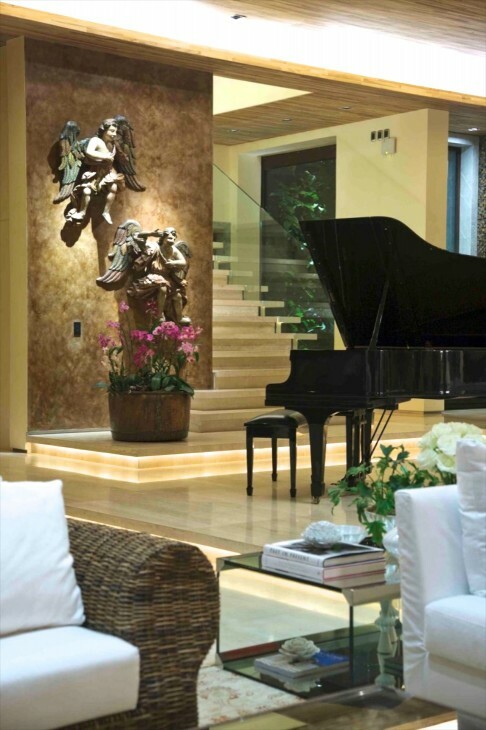 Lighting accents not only the art, but under the stairs. 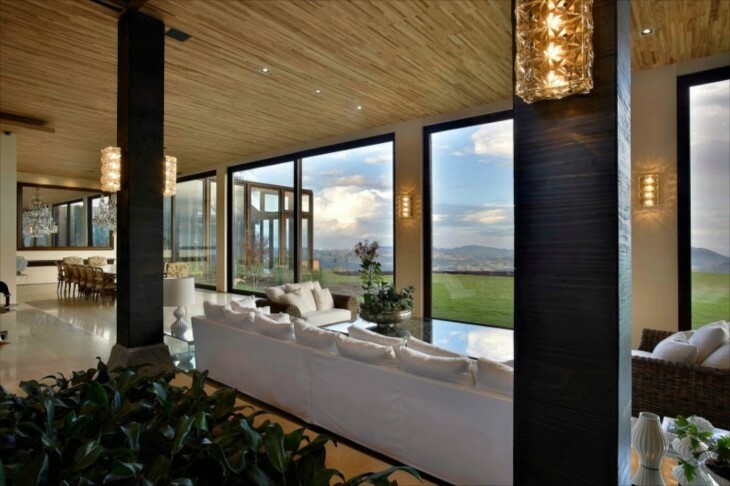 The glass that substitutes for a railing lets the eye move straight to the view out the window. I believe the ceilings are bamboo. Notice the stone at the base of the wood columns, and the stone surround to the left around the door. The view up the stairs. 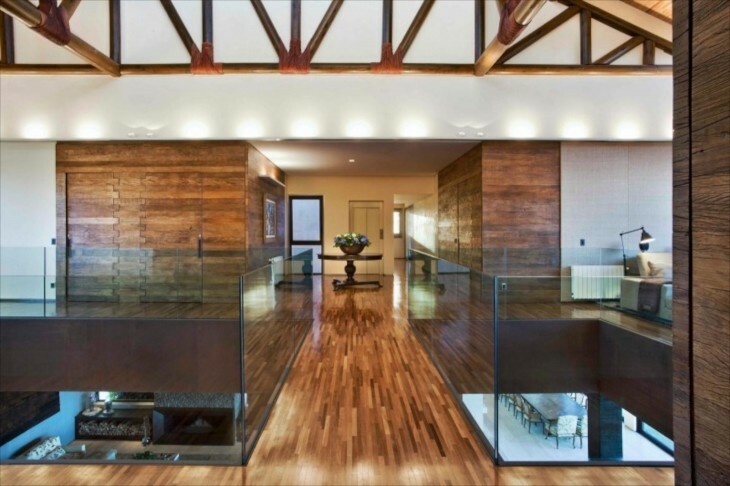 Look at wood the doors to the left and how they must pivot open….such detail. Here the glass allows for open views. 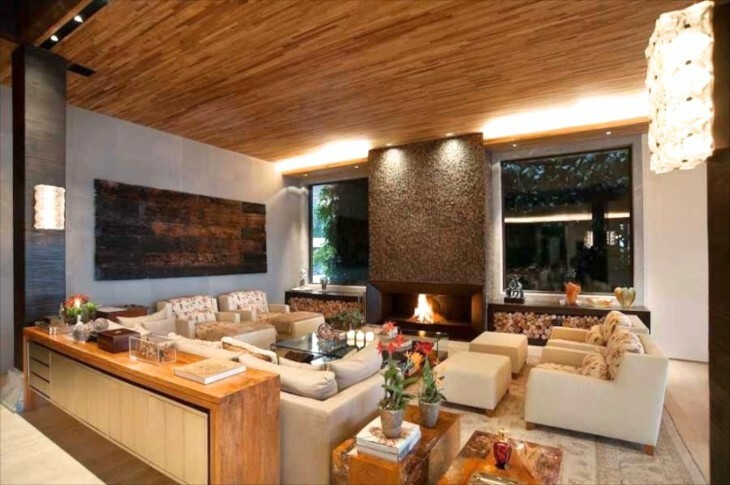 The ceiling beams are wood as well. Back downstairs the white slipcovered sofa and wicker chairs comfortably seat the crowds that must surely gravitate to sit and watch the changing sky and views. A rainbow makes it’s appearance for the camera. 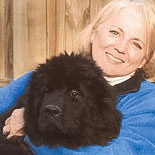 As on mountaintops throughout the world at high elevations, the weather can change at the drop of a hat, and I am sure they see some dramatic changes. 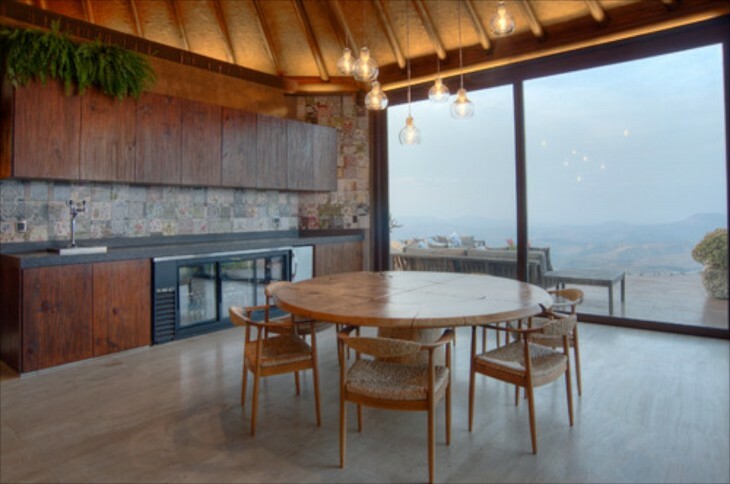 The ceiling in the dining room, which is near the pool area, is also natural straw. 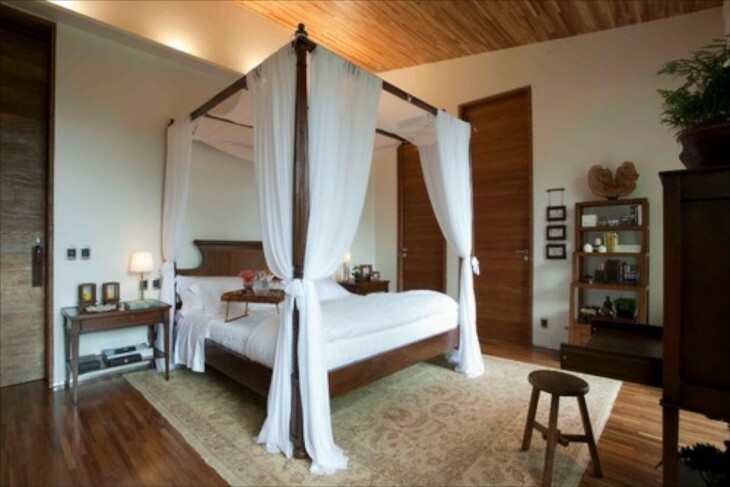 In front of the stone fountain wall hangs a swinging bed hung with chain. The white stone on the wall is what is called Brazilian soap stone. Very much an Asian decor. 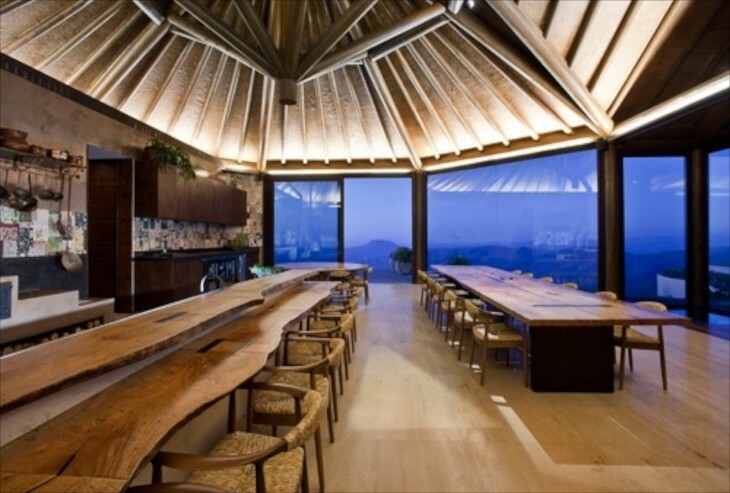 The ceiling structure in this huge open kitchen and entertaining area reminds me of a paper Japanese umbrella. As massive as it is, there is a delicacy to it. The accent lights emphasize the dramatic architecture. 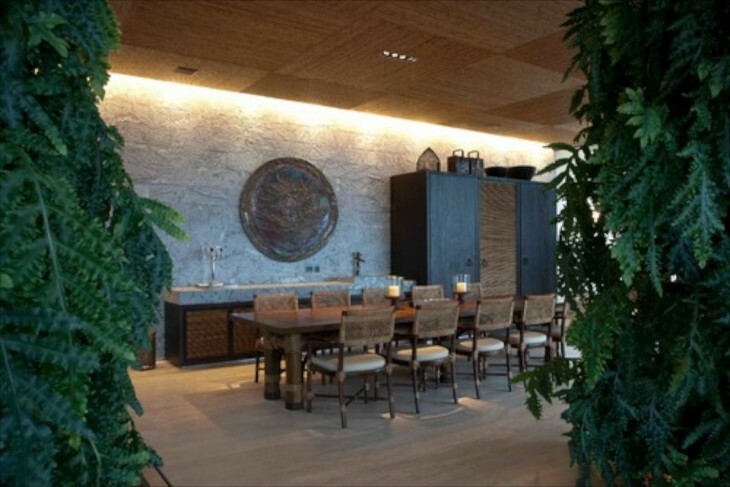 This area can accommodate quite a gathering, yet all the organic elements bring the scale down to warm, yet sophisticated. Oh, and the views! The round table at the end of the long wood counter is shown in more detail below. 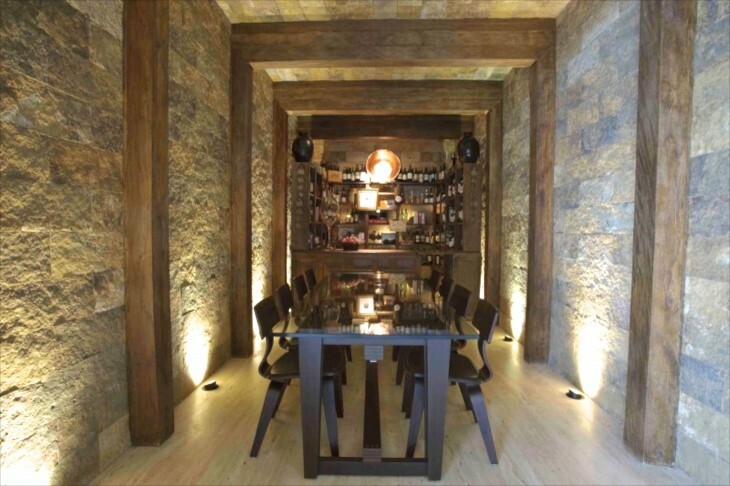 The round table pays homage to the ceiling, and is kind of a punctuation mark to the long table and long island. There is additional seating outside. I could not find out what the lighter back wall is made of…..I think it is fabric squares. If you look closely you can see the delineation between the squares. With lighting at the ceiling drop, I bet at night this house is serene and romantic. Same room as above, but opposite the other wall. 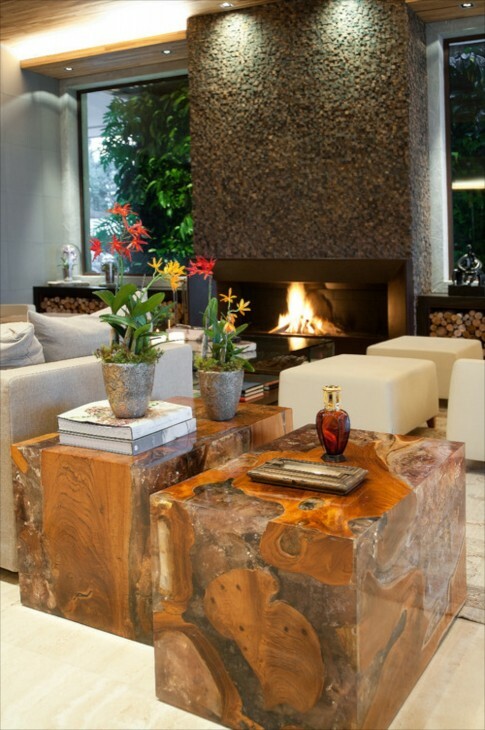 I would love to have these stone tables…..just one would be fine! TV sitting area I believe off the bedroom. The heck with the TV, look at the view! Back in the living room, we see some of the art and accessories closer up. I love the mix of materials in the accessories. Here we see cast bronze next to flowers sitting on a silver tray. 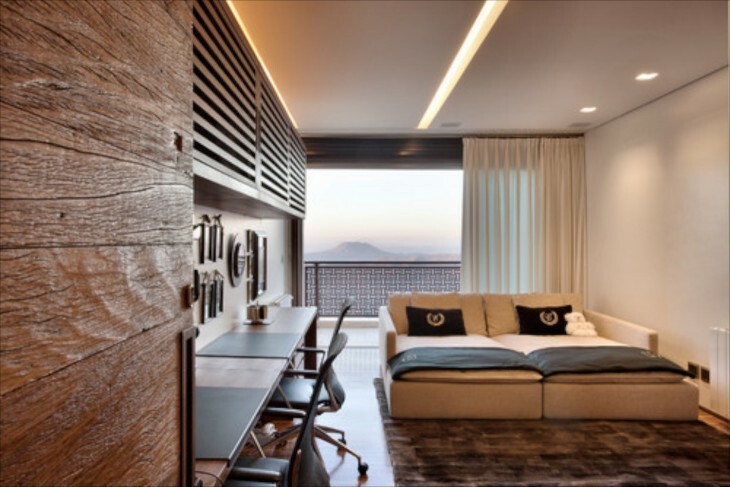 Master bedroom…..simple, clean lines. Notice the height of the wood doors. View into the master bath, You can see the travertine marble close up……looks like sand. The sink sits on top of a wood table and all plumbing is completely hidden. 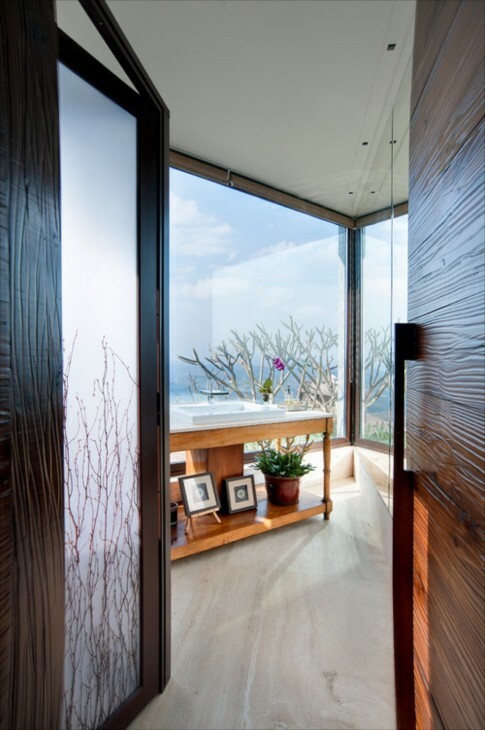 I adore how the bathroom is angled, not just for interest, but it doubles the amount of view. The organic theme is extended in the door to the left with a twig pattern in the glass. 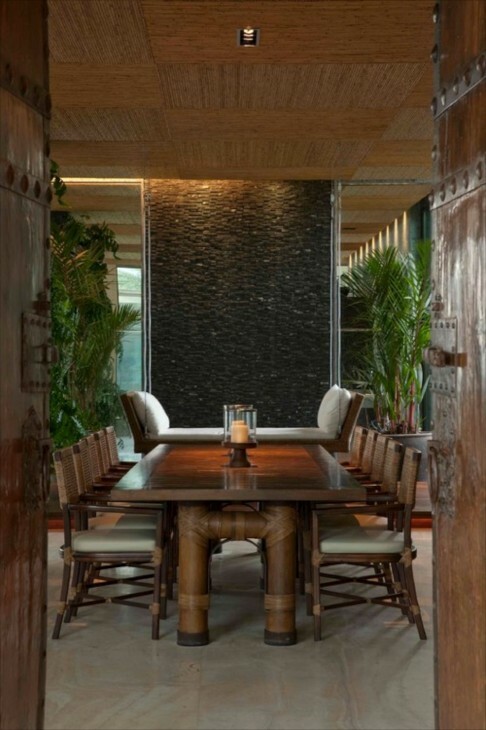 The texture in the horizontal wood door to the right adds dimension. 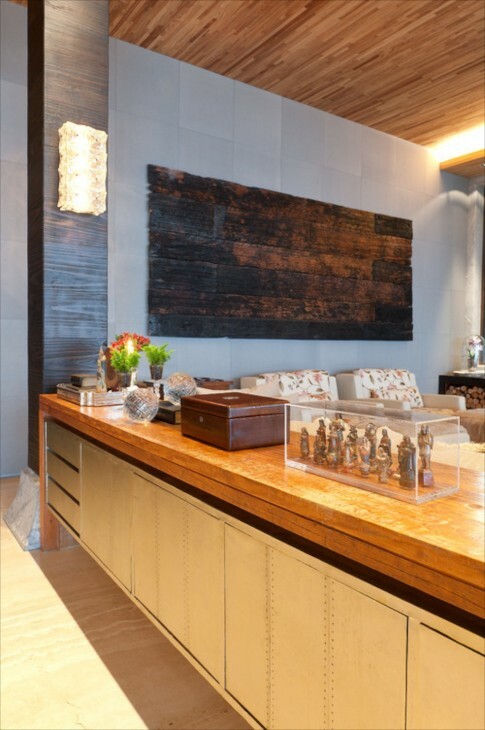 You feel almost compelled to touch so many of the surfaces in this home, at least I do! Gotta love the airplane propeller and the phone. 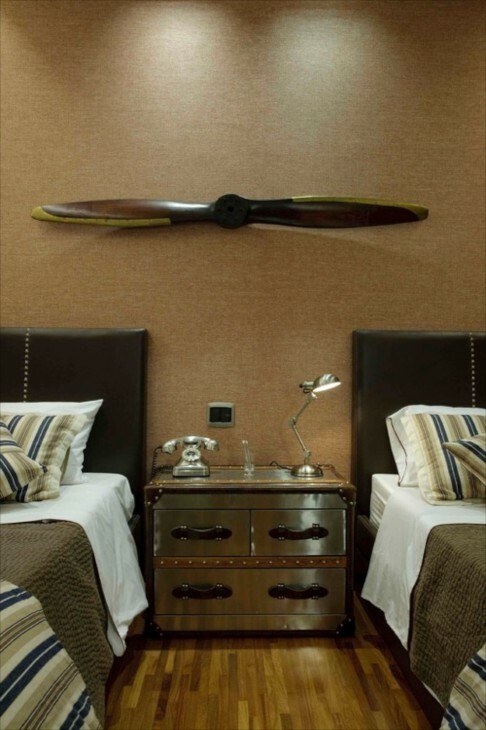 The walls are covered in a textured finish. 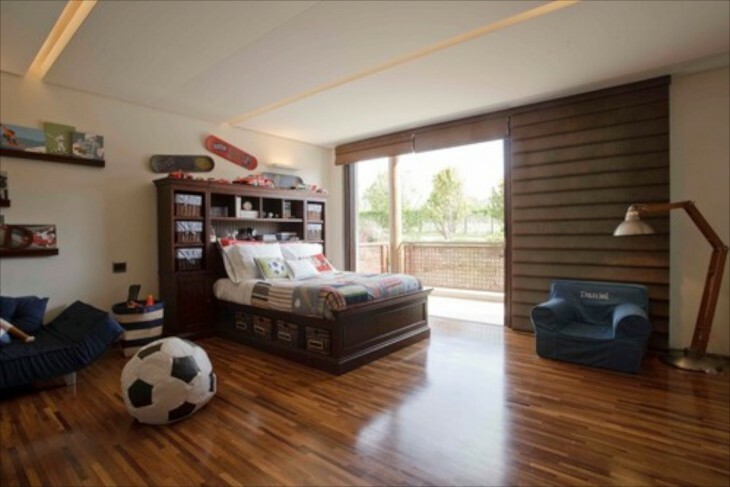 One of the children’s bedrooms. The light on the left looks like it was made from an old quilters hoop stand. Another childs room, also with the same light. 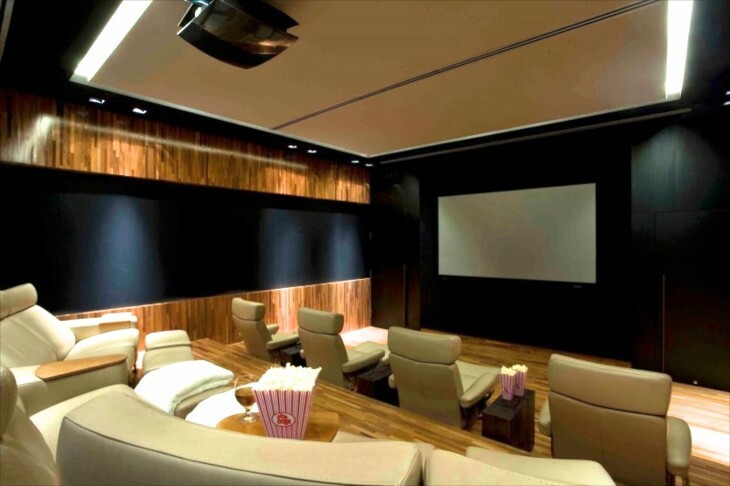 Movie night in full comfort! 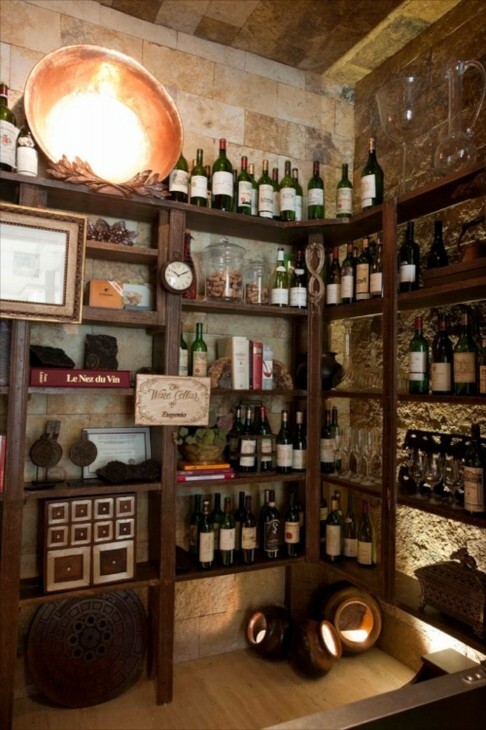 The entrance to one of the most beautiful wine cellars I have yet seen. 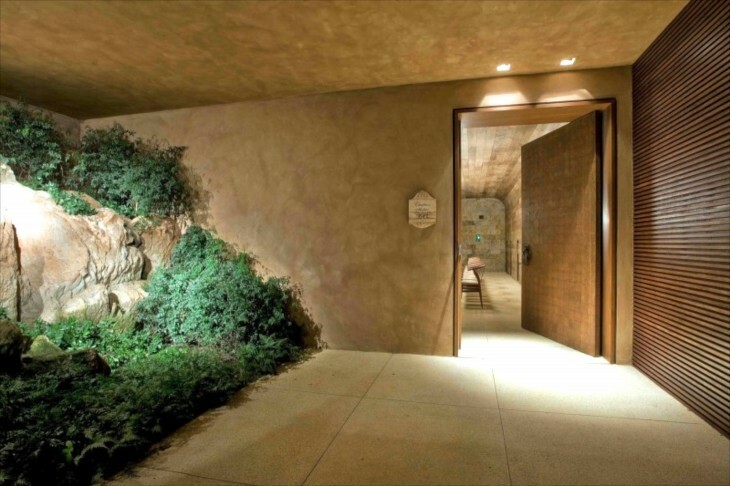 The boulders were integrated into the construction…….Look at the size of the door. 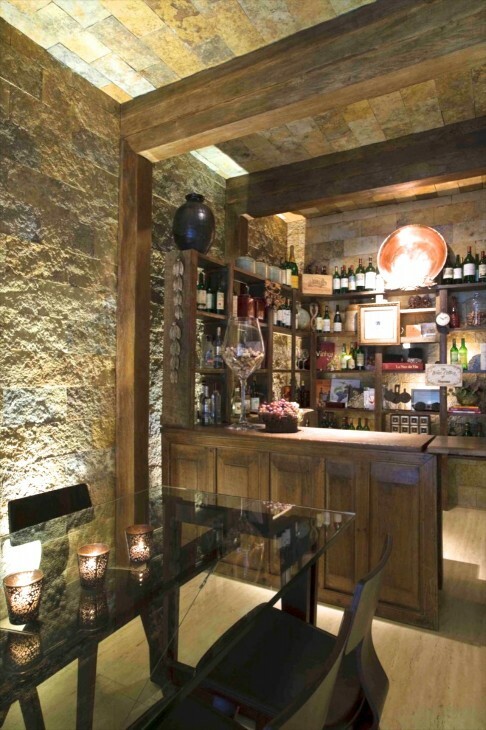 Stone walls and ceilings along with wood beams. The glass table is perfect, and keeps the room from feeling too heavy. The long view with lights that wash the walls in light from the floor. 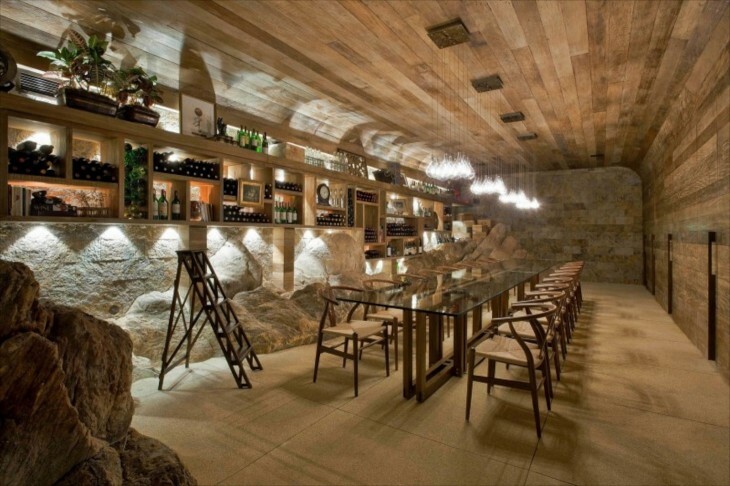 Another section of the cellar, with a barrel vault ceiling, wonderful lighting and again, rock boulders along the base of the left side. I think I counted 20 chairs here. They do some serious entertaining here, and who wouldn’t want to? 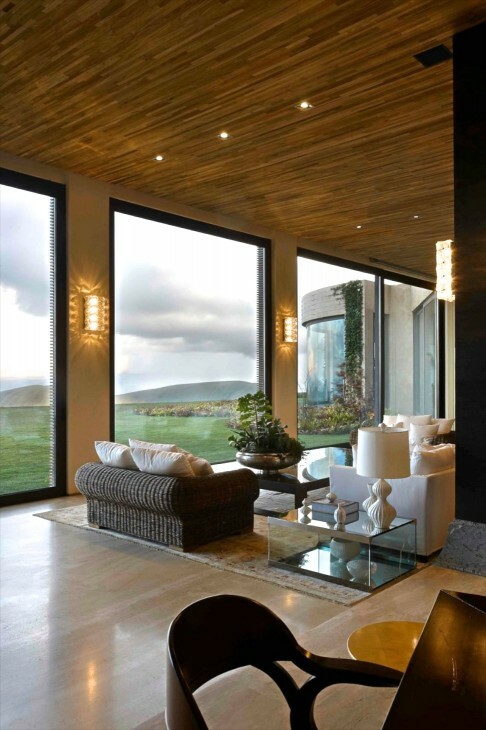 Love the copper bowl at the top and the ball shaped lights on the floor. The end……. I hope you liked seeing this home. I found it to be quite special…..respectful of the land it was built on, sophisticated organic and palatial about sums it up. Warm and inviting does as well. Sigh. Just wonderful and your eloquent commentaries add so much to each photo. Thanks and I hope you have a great weekend. Ah!!! This home is gorgeous!! So interesting. Once again, Location, Location, Location. So many things of beauty inside .